Facial recognition systems perform some very challenging tasks such as checking an individual’s photo against a database of known or suspected criminals. The task can become nearly impossible when the systems acquire poor facial images—a situation that occurs all too often in real-world environments. Now, researchers at the National Institute of Standards and Technology have found that several simple steps can significantly improve the quality of facial images that are acquired at border entry points such as airports and seaports. Better yet, the NIST recommendations for improving facial images can be implemented relatively easily with existing facial recognition technology. Travelers entering the United States have their pictures taken and their fingerprints collected digitally as part of the US-VISIT program implemented by the Department of Homeland Security (DHS). US-VISIT and NIST work together on an ongoing basis to improve processes and technology. 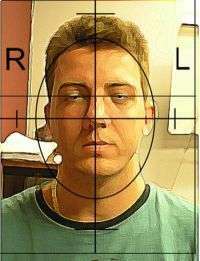 A 2007 NIST study of facial images collected at border entry points, however, found that the captured facial images were not as clear and useful for automated recognition as they could be. In usability and human factors research performed for US-VISIT as part of a large joint effort to improve facial recognition technology, NIST’s Mary Theofanos and her colleagues sought simple ways of obtaining better facial images in often hectic real-world conditions without having to deploy new technology. The NIST researchers first visited and observed a DHS border entry point at Dulles Airport in the Washington, D.C. area to see the facial-image capturing process. As a result of these observations, the researchers identified and shared with US-VISIT a number of steps to take for acquiring better facial images. For example, the report recommends that operators should adjust camera settings to ensure the subject comes into sharp focus. The report also recommends using a traditional-looking camera in facial-recognition systems so that individuals could clearly recognize the camera and look into it. Following the Dulles site visit, a study adopted these steps in taking facial images of 300 participants while mimicking the real-world conditions of a border entry point. In these tests, 100 percent of the images fully captured the participant's face; all of the participants faced the camera; and the researchers found additional improvements by using a graphical overlay to the camera display in order to better position the camera. The researchers believe these steps will improve the performance of facial recognition systems in real-world settings using existing technology. A follow-up study is underway in which the researchers are incorporating the graphical overlay into the workflow of camera operators.